A few things I would like to share, to make sure you don’t miss new recipes or meal plans make sure you’re signed up for my email subscription (it’s free!). Second, have you pre-ordered my cookbook Skinnytaste One and Done? It comes out Oct 9, but you can get 4 free recipes from the book now, with your pre-order. More details here! *Arugula salad includes 7 ½ cups arugula, 2 ½ ounces shaved parmesan and 10 tablespoons balsamic vinaigrette. Serves 4 plus an extra serving for Tues lunch. Thank you for making these!! Love the meal plans and the flexibility it gives to add in a little treat here any there. Plus everything tastes so good and is simple to make. I’m not what one would consider a great cook, so your recipes are super helpful. HI. 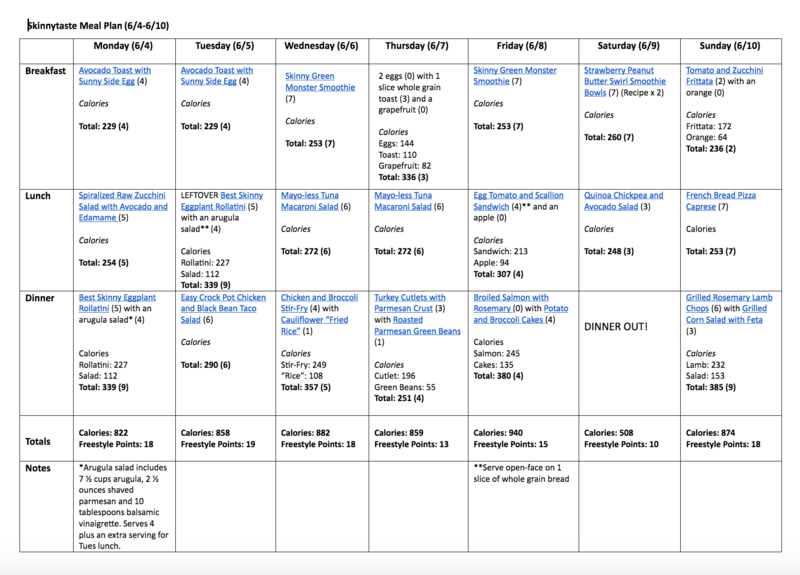 I’ve been wanting to do the meal plans for a long time and chose this one as my first. I am super excited to work the week. Everything I have made one off on the site has been fabulous and my husband loves everything I have made. You develop recipes that are exactly how I like to eat. Please keep doing the plans!!! I can’t imagine how hard they are to put together, but they are appreciated. This meal plan has been great! My first time using one and I couldn’t be more pleased. Thank you for helping me figure out what to cook!!! I enjoy your meal plans. Although I don’t use them as written day by day I do use them for ideas for the week and often make something from your meal plan during the week. Thank you for posting them! I use your meal plans every week. Please dont stop sharing them! Thank you!! Thank you A MILLION for posting your meal plans. I ran into your account through a friend on Instagram and I couldn’t be anymore grateful. I was recently in an accident that caused me to be bedridden which lead to a weight gain of 20 lbs. in 2 MONTHS! I finally started working out last week but was missing my healthy meals. I took a peak at your website and found your amazing meal plans. I LOVE this meal plan an hope you continue to do more. I am on day 3 and loving it. I use your meal plans weekly! I love that the grocery list is added to make shopping easier. Thank you! Thank you so much for these plans!! Along with your cookbooks, these plans are my best tool for reaching goal weight. I love your meal plans!! Thank you for creating and sharing them!! Love how organizsed your Menu plans are and super delicius recipes. Thanks. Yes!!!!! I use your plans! My husband thinks I’m an amazing cook and we are both getting healthy together. Keep’em coming! I love the meal plans!! So helpful to me as I’m trying to plan healthy meals for my family! Your weekly plans make my meal planning so much easier! All the guess work and searching is gone. And now it’s also healthier and always super tasty! Thank you! I find your meal plans very helpful, even if I don’t use every meal. I hope you continue them. I also have your books. Love the meal plans. Sometimes the planning is the hardest part. I love your plans as a base for my week! Thank you for sharing them. Thank you sooo much for sharing your meal plans! I constantly use your skinny taste cook book and have shared my love of the meals ive made from it with just about everyone!! Yes I use them, they are such a huge help to me, I hope you continue them. As to your question, yes I use your meal plans and thank you so much for providing them. 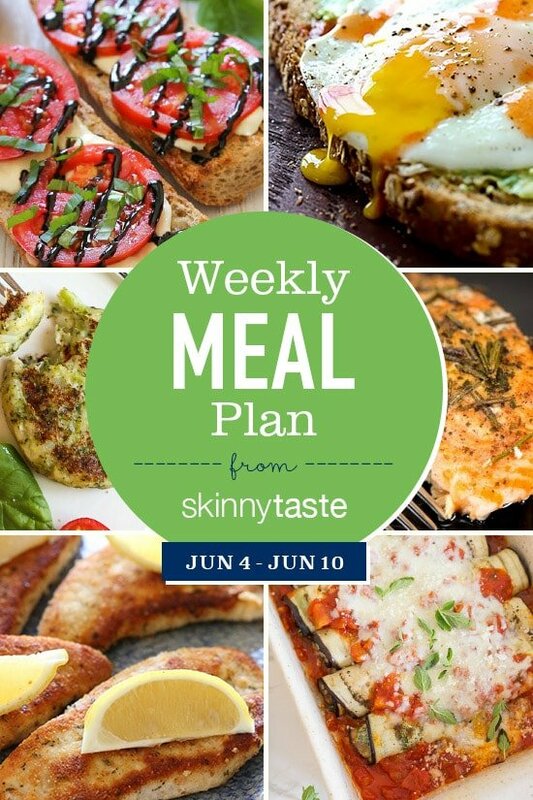 Love and look forward to these meal plans every week!!! Thank you, thank you, thank you!! Thank You! These sound delicious and so helpful including the Freestyle points! !